Such good ideas about style! I love that bag!!! There is something so amazing about her style! I really love this dress on her! Thanks for the pictures! hmm i love her look! the colors are so nice! Hi! I really like your blog. I also have a blog that we update every week with new photos taken in the street of Barcelona. I'm Chiara and I write for an Italian magazine, called MINIMAG (this is our blog: http://minimag-azine.blogspot.com/). Specifically, our magazine is a freee press street style magazine. We have seen your blog and we have appreciated your pictures a lot. We have a column where, if you are interested, we're going to do a review of your blog also publishing some of your pictures (obviously reporting your credits and web link). If you are interested in it, we only need an answer to this e-mail in order to have a written authorisation to publish your pictures. Then, when the magazine number will be ready, we'll send you the .pdf file or the link where you will be able to find it. Afterwards, if you wish collabotare with us, we could keep in touch, becuase we're looking for correspondents in several cities for our street style observatory project. I just love her dress, it's so vibrant, and the non-fussy hair which doesn't draw attention away from her outfit! Trying to get a hold on you Ave.
How do we reach u? great photos. I really am into your outlook on street style. I am a new blogger so blog likes yours are really inspiring. 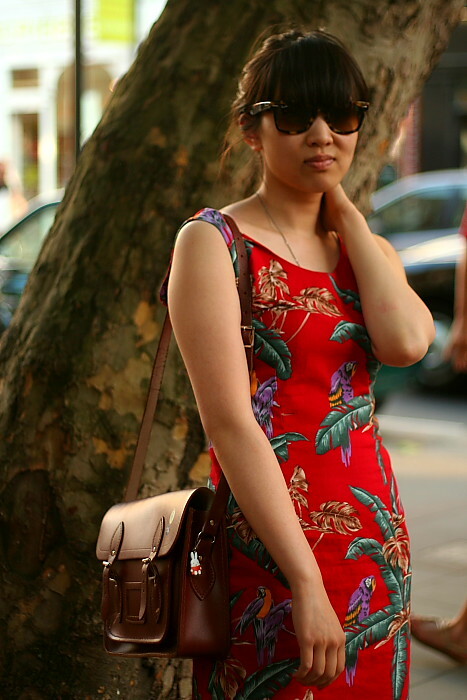 hey I really like your street style outlook, your pictures are great, relly natural.